I put together the statement below about fracking as a part of our campaign to ban fracking in Maryland. The UUCSS Green Sanctuary Committee adopted this statement at its February 7, 2017 meeting. 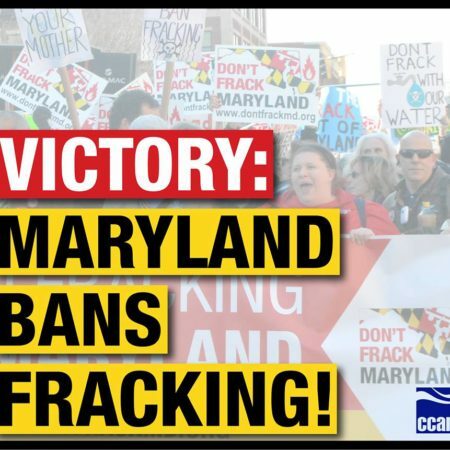 Partly as a result of our work, the State legislature passed, and Governor Hogan signed into law, a permanent ban on all fracking in the State of Maryland in April of 2017. Because it reflects the moral and political urgency of our campaign, I have not altered the original words of our statement. The process of fracturing, or “fracking” which injects water, chemicals, and sand under high pressure into underground rock formations to release natural gas, has been tied to health problems, water contamination, and climate change in the United States. The State of Maryland placed a two-year moratorium on fracking that will expire in October 2017. The Chesapeake Climate Action Network, 350.org., and other environmental groups are advocating for a bill that will completely ban fracking in Maryland. The bill, which has broad support, will be voted on during this session of the State General Assembly. A recent study at Johns Hopkins University found that people who live near natural gas wells “are nearly twice as likely to suffer from a combination of migraine headaches, chronic nasal and sinus symptoms, and severe fatigue” than others who live elsewhere. In Wyoming, nearby fracking wells have killed livestock that drank ground water. In Texas, water pollution from fracking has driven whole communities from their homes. And in neighboring Pennsylvania, the film Gasland showed residents turning on their water faucets and igniting the methane that poured from them. Fracking has already contaminated millions of gallons of drinking water in the states that have allowed it. When the drilling process disturbs rock formations underground, the chemicals used in fracking, together with the methane gas, can mix with drinking water supplies. Also, the carcinogenic chemicals used in drilling must be hauled away from the site and stored in large retaining pools; the pools can seep into ground water and wash into nearby streams. In Wyoming, nearby fracking wells have killed livestock that drank ground water. In Texas, water pollution from fracking has driven whole communities from their homes. And in neighboring Pennsylvania, the film Gasland showed residents turning on their water faucets and igniting the methane that poured from them. Some politicians have called the methane gas released through fracking a “transitional” energy source that is helping to move our country from relying on coal and oil to wind and solar. Those politicians are wrong. Methane is a direct contributor to climate change, the disastrous process that is already making parts of the earth uninhabitable. Like the carbon dioxide generated by burning coal and oil, methane gas traps the sun’s rays in the planet’s atmosphere, turning the earth into a giant greenhouse. Despite precautions, some methane gas is always released when fracking wells are drilled, either directly at the well head or indirectly through other openings in the ground. Methane can also leak out of gas lines, which must be laid across fields and communities to pipe gas to distributors and markets. Once in the atmosphere, the greenhouse-gas effect of methane is initially a hundred times stronger than carbon dioxide. Even after a hundred years, a molecule of methane remains twenty-five times more potent than carbon dioxide for trapping heat. Once in the atmosphere, the greenhouse-gas effect of methane is initially a hundred times stronger than carbon dioxide. Even after a hundred years, a molecule of methane remains twenty-five times more potent than carbon dioxide for trapping heat. As climate scientists know, higher planetary temperatures are already melting the ice at both poles, erasing coastlines, and helping to cause more forest fires, the spread of deserts, and wilder swings of extreme weather. The long-term effects of fracking and methane on our global ecosystem will be disastrous. Why build a infrastructure to support fracking now that will only need to be dismantled later when governments realize they must restrain carbon emissions to save our ecosystem and ourselves? Why build a infrastructure to support fracking now that will only need to be dismantled later when governments realize they must restrain carbon emissions to save our ecosystem and ourselves? Maryland voters are waking up to the effects of fracking. A poll conducted in August and September by OpinionWorks found that 56% of all registered voters in MD support a ban on fracking, while only half that number oppose the ban. The poll also found that the leading citizen worry about fracking was “water contamination” with “harm to human/animal health” and “harm to the environment generally” a close second and third concern. This poll of 802 registered voters, carefully selected to be representative of the electorate, was conducted over cell and landline telephones and claims a potential margin of error of 3.5%.